The Dracula Dossier. Before we get to the exclusive preview some kind of disclaimer: I am a fan of Night’s Black Agents RPG and an early backer of the current Kickstarter by Pelgrane Press. We played Ken Hite’s Gumshoe interpretation of spies hunting down vampires at a convention and we loved the tone of the game. („Normal“) Men vs. supernatural monsters, nothing is as it seems – are vampires real, they might be something you didn’t think of. Great storytelling possibilities. Therefore, I did not have to think twice to support The Dracula Dossier Kickstarter. 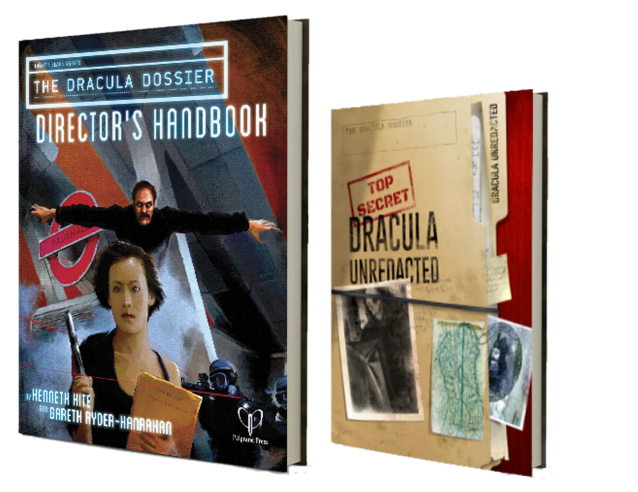 What is The Dracula Dossier about? „Two Books. One Mission. Dracula is not a novel. It’s the censored version of Bram Stoker’s after-action report of the failed British Intelligence attempt to recruit a vampire in 1894. Kenneth Hite has restored the deleted sections, inserting annotations and clues left by three generations of MI6 analysts. This is Dracula Unredacted. Follow those clues to The Director’s Handbook, containing hundreds of encounters: shady NPCs, dangerous locations, conspiratorial nodes, and mysterious objects. 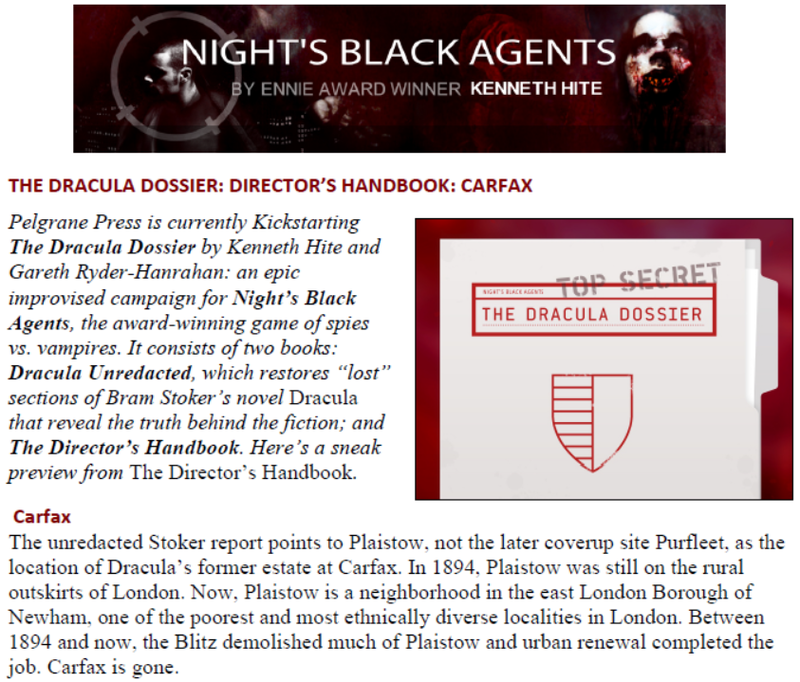 )Together they comprise The Dracula Dossier — an epic improvised, collaborative campaign for Night’s Black Agents, our award-winning vampire spy thriller RPG. The preview is about Carfax (4 pages, PDF) – a „secret facility“ of Operation Edom. This project was founded by the British Naval Intelligence Department. They wanted to recruit a very a special agent: a vampire. Unfortunately, Dracula is not an easily controllable asset. Kill Dracula for good. You might need the The Dracula Dossier for further information. The books are still being kickstarted. Good night, and good luck! Wade Rockett and the Pelgrane Press team, thank you for the preview.